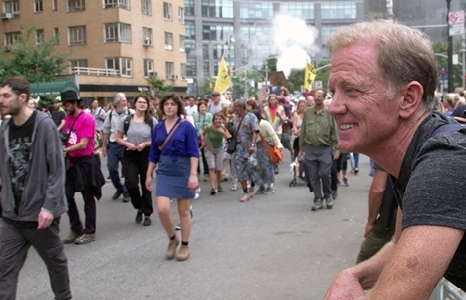 Filmmaker James Redford (son of Robert) embarks on a colorful personal journey into the dawn of the clean energy era as it creates jobs, turns profits, and makes communities stronger and healthier across the U.S. Unlikely entrepreneurs in communities from Georgetown, Texas, to Buffalo, New York, reveal pioneering clean energy solutions while Redford’s discovery of how clean energy works, and what it means at a personal level, becomes the audiences’ discovery too. Reaching beyond a great story of technology and innovation, this documentary explores issues of human resilience, social justice, embracing the future, and finding hope for our survival. Melissa Miyashiro is Chief of Staff at Blue Planet Foundation and leads the nonprofit's strategic planning, policy, and organizational development. She received a law degree and a certificate in environmental law from the William S. Richardson School of Law (University of Hawai'i) and a B.S. in environmental science from the University of Denver. Before Blue Planet, Melissa worked as a legal fellow assisting state agencies in Hawai'i with rulemaking, invasive species law and policy, and inter-agency coordination. She has authored papers on climate justice and taught persuasive writing and legislative advocacy at UH. Melissa also worked as a litigator in private practice and completed a clerkship at the Hawai'i Intermediate Court of Appeals. Before attending law school, Melissa worked as an environmental scientist for a Hawai'i-based consulting company. Dawn Lippert is CEO of Elemental Excelerator and oversees the strategic direction of the organization and execution of its mission. Dawn also serves as the Director of Innovation and Community at Emerson Elemental, the platform of Emerson Collective committed to strengthening the relationship between humanity and nature through scalable, equitable and innovative solutions. Dawn has been funding and investing in startups since 2009. Dawn is the Chair of the Hawaii Clean Energy Initiative Advisory Board, a board of key energy decision makers that ensure progress toward Hawai'i’s goal of 100% renewable energy by 2045. Dawn is a recipient of the 2015 C3E Award from the Clean Energy Ministerial and was selected as an Omidyar Fellow by the Hawaii Leadership Forum. She also serves on the boards of WiRE (Women in Renewable Energy, an organization she founded in 2011) and Incubatenergy Network (a national network of clean energy organizations organized by the U.S. Department of Energy. Kristen D. Brown currently lives in Ewa Beach, Hawai'i, where she attends James Campbell High School. She maintains a 3.5 grade point average while taking demanding advanced placement and early college courses. She is an active member of the Honolulu Branch of the NAACP and an active member of the Nanakuli Performing Arts Counsel (NPAC). Kristen was recently selected to study sea level rise in Iceland. During her trip she toured a receding glacier, visited the world's third largest geothermal power plant, and spoke with local leaders on topics related to sea level rise and climate change. Kristen is passionate about conserving the environment and musical theater. In her free time she enjoys singing and playing the piano. Upon graduating, she will continue to study performing arts and environmental justice. Veronica Rocha (Moderator) leads the Renewable Energy Branch (REB) for the Hawaii State Energy Office (HSEO), responsible for Hawai'i’s achievement of 100% renewable energy by 2045. Under her leadership, REB has guided the HSEO on key renewable energy strategies, policies and programs. Veronica is also the leader of several important partnerships between the State of Hawai'i and public coalitions and agencies, including Governor Ige’s representative for the Governors' Wind & Solar Energy Coalition. Veronica also serves as president of Women in Renewable Energy (WiRE), a Hawai'i-based non-profit comprising over 135 members dedicated to providing women a forum to bring about a more sustainable Hawai'i, powered by clean energy. In 2017, Veronica was named one of the “Top 40 Under 40 Business Leaders” by Pacific Business News.